Some B Series errors can be quite spectacular. Here's one that I had not spotted before — Partial offset transfer on a £10 note. 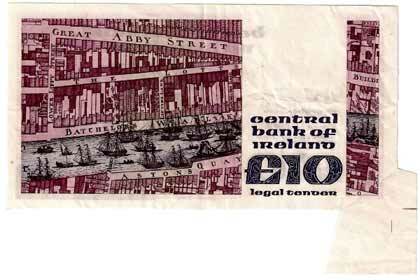 Ireland 10 Pounds 1983 error note. This one is my favourite of B series errors. Normal Yeats 20 Pound note for comparison. A similar error, this time with Queen Medb absent from her throne on the B Series £1 note. I've seen a few of these over the years. 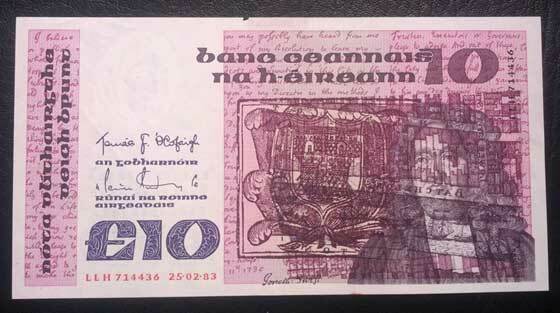 Here's an error with extra paper, caused by the banknote being folded when it was being cut. Here is another £20 error with print missing which is a bit different from the one above. It fetched around $250 in the Whyte sale in Dublin today. Are any 5 pound or 50 pound errors known in the collecting community? I have seen a £5 B Series error note with extra print, similar to the £10 note above. Haven't seen a £50. Ireland 5 pounds 1981 print error. This note has most of the face print on the reverse also. The face of the note is normal. That's a printed fold error - nice! Do you have a scan of the face and reverse of the entire note? I'd add it to the main web site. Mac wrote: That's a printed fold error - nice!